There is little dispute that requiring local governments to shoulder a large share of Medicaid costs—based not on ability to pay, but on historic patterns of need—is outmoded, dysfunctional and unfair. This system puts a disproportionately high burden on localities with poorer residents and weaker tax bases. Even for wealthier counties, Medicaid is one of Albany’s most onerous unfunded mandates—a major, ongoing expense over which local officials have no control. Offsetting the loss of that much revenue would require either an enormous tax hike, deep cuts to health care spending or, most plausibly, a concerted, multi-year push to squeeze efficiency from the Medicaid program. Further complicating the task is the lopsided regional distribution of the burden. New York City accounts for fully two-thirds of the local cost, and poorer upstate areas pay proportionally more than the wealthier downstate suburbs. A comprehensive solution would necessarily skew in the opposite direction, with New York City residents reaping most of the benefit, and downstate suburban taxpayers taking a financial hit. In the past two years, county leaders’ perennial call to be relieved from Medicaid costs has gained new momentum. State takeover plans have been put forward by members of Congress, state legislators and at least two candidates for governor. However, these proposals either exclude New York City or offer it only partial relief—which would be hard to justify as a matter of fairness—and none fully addresses the question of financing. This issue brief explores the financial considerations and policy challenges associated with eliminating the local Medicaid share and reviews the major options for implementing a state takeover. Regardless of how approached, such a takeover would represent a major change in a program affecting the lives and livelihoods of millions of New Yorkers. The cost and complexity of the task should not be underestimated, and all options would require difficult trade-offs. Medicaid is a government-run health plan for the poor and disabled that is managed by states under federal guidelines, and was significantly expanded as part of the Affordable Care Act. New York’s version is one of the largest, most generous and costliest Medicaid programs in the country. It currently covers more than 6 million New Yorkers, or about one-third of the population, with a total budget for fiscal year 2019 of $70 billion. The program is financed with a mix of federal and state-based money, with the federal share varying according to a state’s per capita income. In New York, Washington pays a bit more than half of overall costs. Local governments originally paid half of the non-federal share, or 25 percent of total costs, for medical bills incurred by their low-income or disabled residents. This percentage declined over the years as the state reduced or limited the local share of certain portions of the program. Starting in 2006, then-Governor George Pataki successfully pushed the Legislature to cap the growth of counties’ Medicaid expenses at 3 percent per year, shifting more costs to Albany. In 2012, in a measure advanced by Governor Cuomo, lawmakers phased the cap down to 0 percent, freezing the local share as of 2015. The frozen amount now paid by local governments is $7.6 billion, including $5.3 billion from New York City and $2.3 billion from the other 57 counties combined. That amounts to about 12 percent of the total Medicaid budget, a share that gets gradually smaller as overall spending rises. This heavy burden falls unevenly across the state—because the cost for each jurisdiction is based not on ability to pay, but on historic usage of the program by local residents. Hardest hit by most measures is New York City, largely due to its disproportionately large population of Medicaid recipients. (See Table 1.) Its Medicaid costs are the highest in the state, both on a per-capita basis and as a share of personal income, and fifth highest as a share of property value. With sales taxes and other revenues factored in, Medicaid accounts for 9 percent of counties’ total spending on average, ranging from 3 percent in Hamilton to 16 percent in Fulton. Of course, property owners outside New York City pay taxes not just to county governments, but also to school districts, cities, towns, villages and fire districts. 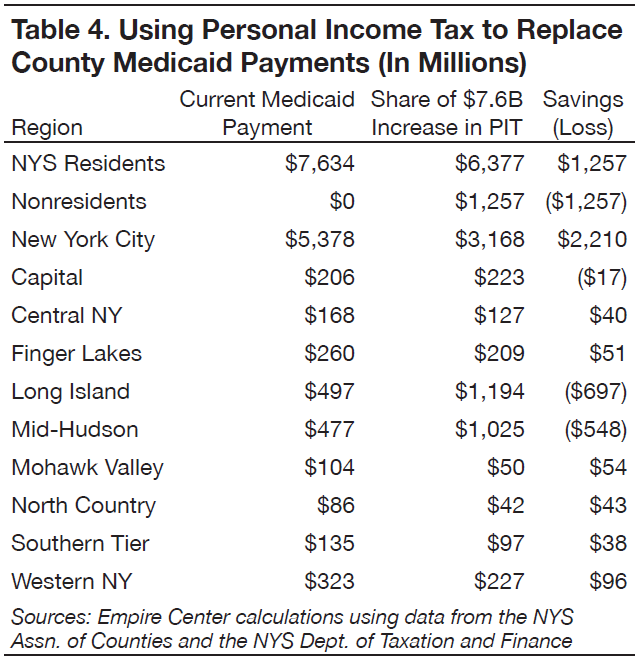 As a share of total property-tax liability—which is arguably the more relevant comparison—local Medicaid costs average 7 percent outside New York City. 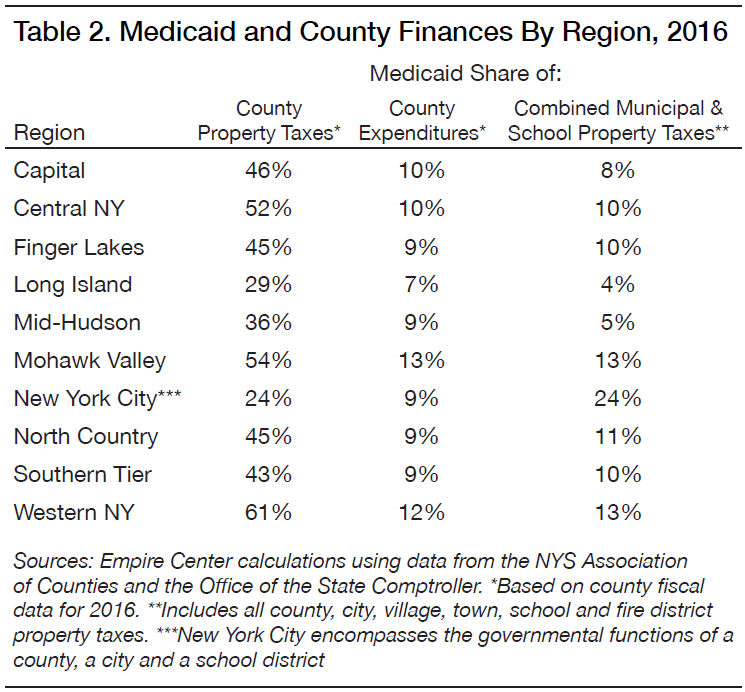 For New York City, which is both much larger and differently structured than other counties, Medicaid costs equate to 24 percent of property tax revenues, and 9 percent of overall revenues. 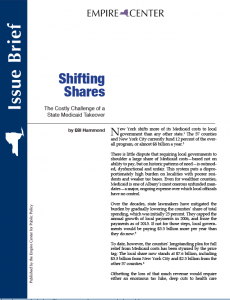 Calls to eliminate the local share of New York Medicaid date back to its earliest years. One of the first came from Governor Nelson Rockefeller in 1967, just one year after lawmakers launched the program at his urging. Also proposing state takeovers during their terms were Governors Hugh Carey and Mario Cuomo. Those early plans typically called for some version of a tax swap. In 1994, for example, Mario Cuomo called for counties to forfeit a portion of their sales tax revenue—and for New York City to give up part of its income tax revenue—in return for the state taking over the local Medicaid share. This would have been advantageous for counties at the time, because Medicaid costs were rising more rapidly than sales tax revenue. However, Mario Cuomo’s plan was not taken up by the Legislature. The debate over a state takeover was rekindled in 2017 with the election of U.S. Rep. John Faso (R-Columbia County), a former Assembly minority leader, who had campaigned on the issue. In March 2017, Faso and Rep. Chris Collins (R-Erie County) cosponsored federal legislation requiring New York to eliminate the local share of Medicaid for counties outside New York City within two years.9 Faso and Collins later added the same provision as an amendment to several GOP bills aimed at repealing and replacing the Affordable Care Act—one of which came within a single vote of passage in Congress. The Senate bills would mandate that local governments dedicate their savings to reducing local taxes, but provide no specifics for how compliance would be defined or enforced. A state takeover of local Medicaid costs has also been advocated by two gubernatorial candidates: Dutchess County Executive Marcus Molinaro, a Republican, and former Syracuse Mayor Stephanie Miner, a Democrat seeking to run as an independent. As of early July, neither had released a detailed plan. The primary goal of all such proposals is property tax relief. A full state takeover would equate to a 24 percent reduction in property taxes imposed by New York City, and an average 40 percent reduction in county taxes elsewhere in the state. 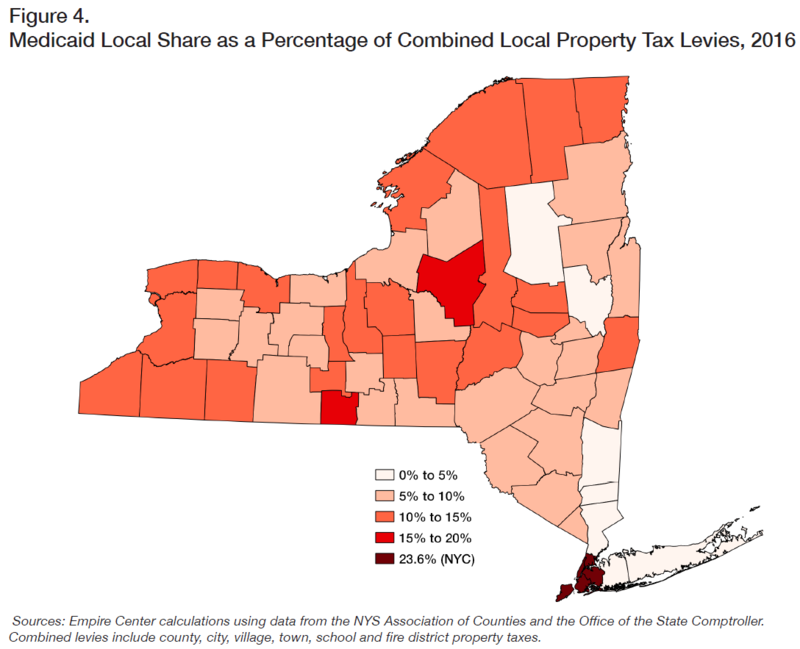 As discussed, however, the potential relief as a share of total property taxes outside New York City would average a relatively modest 7 percent—lower in downstate suburbs, higher in upstate counties. As it now stands, the local share of Medicaid is an unfunded mandate that imposes disproportionate costs on poorer jurisdictions while contributing to New York’s high local tax rates across the board. It’s unlikely that state lawmakers would approve such a system if they were designing the program from scratch. Worthy as it is, however, the goal of eliminating the local share is expensive and must compete with other priorities. If Albany had an extra $8 billion per year to spend, it’s not clear that local tax relief should take precedence over, say, an investment in infrastructure. Assuming the state does commit to a takeover, it should take care to do so in way that does not create equally problematic tax burdens and inequities somewhere else. One strategy for reducing the cost of a takeover would be to limit is applicability to New York City, which accounts for 70 percent of local spending on Medicaid. The Assembly minority’s plan would eliminate only half of the city’s contribution, and do so over twice as long a period as for other counties. One of the two bills passed by the Senate would phase out $2.3 billion of the city’s share, which is less than half of its $5.3 billion tab. The second Senate bill would omit the city entirely, as would the Collins-Faso amendment in Washington. While this would expediently reduce the cost of a takeover, excluding New York City would be hard to justify on policy grounds. Creating such an exception would arbitrarily limit or deny relief to the group of local taxpayers shouldering by far the heaviest cost. Plus, it would put city residents (and a large number of Connecticut and New Jersey commuters with jobs in the city) in the position of subsidizing relief for others, because they pay a disproportionately large share of the state taxes redistributed from Albany. The effect would be to make the state’s Medicaid financing system more inequitable than it already is. A more constructive way to limit cost would be to provide partial relief to all jurisdictions based on need. For example, the state could commit to take over the portion of each county’s contribution that exceeds a certain share of its residents’ incomes, or of the local property value. One takeover approach that has been floated repeatedly in the past—by Mario Cuomo and others—would take the form of a sales tax “swap”: The state would assume responsibility for the counties’ share of Medicaid costs in return for counties giving up a portion of their revenue from sales taxes. This has the potential advantage of spreading costs less regressively—at least among counties outside New York City. 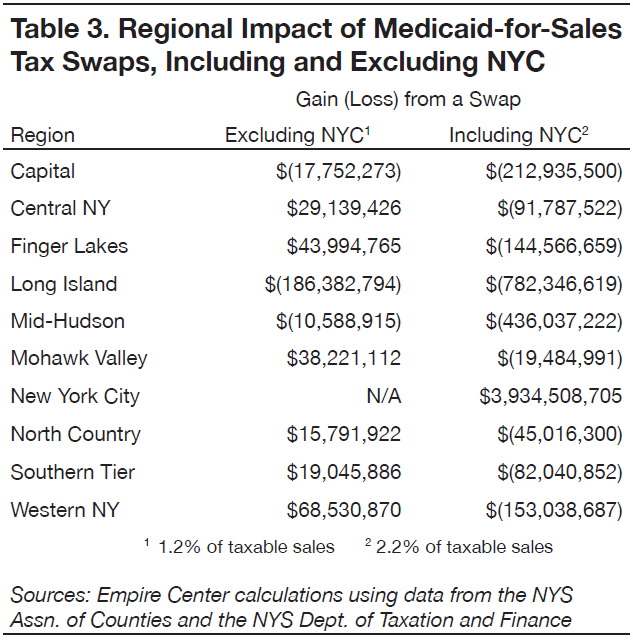 Table 3 and Appendix 4 show the effects of two tax swap scenarios. The first assumes that New York City would be excluded. To offset the Medicaid payments of the other 57 counties, the state would need to divert 1.2 percentage points of the counties’ taxable sales. Counties with relatively more Medicaid recipients and less retail business—mostly upstate—would generally save money, at least in the short term. 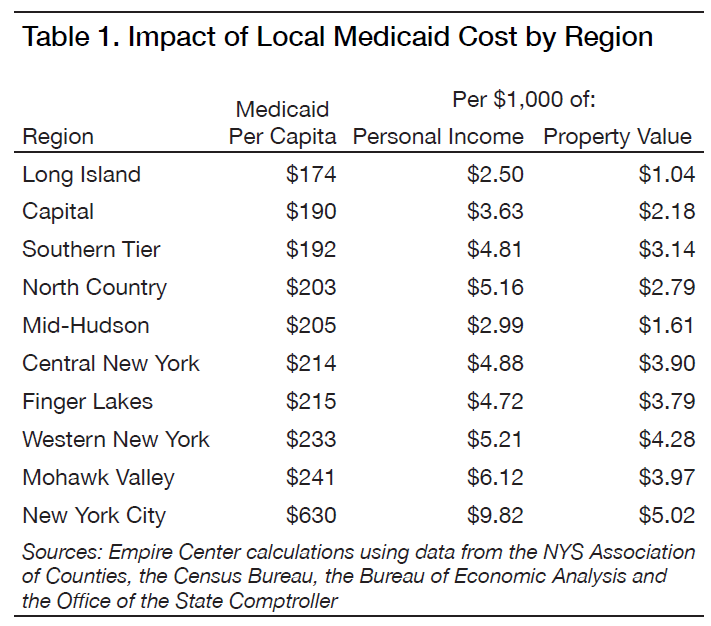 The mid-Hudson suburbs and Long Island, with relatively few Medicaid recipients and stronger retail economies, would pay more. Under the second scenario, which includes New York City, the share of sales tax necessary to finance the swap would rise to 2.2 percentage points. The city would reap the vast majority of savings and most other counties would experience a net loss. money for all counties in the long run. Now that the local share is frozen, however, the dynamic has reversed. Sales taxes generally rise and local Medicaid costs are fixed, meaning a swap would eventually leave all counties worse off than before. Even in the context of a $170 billion all-funds state budget, finding another $7.6 billion in revenue would be no small matter. The state’s total tax collections—including levies on personal income, business income, retail sales, cigarettes and gasoline—are projected to be $78 billion.15 The cost of a takeover equates to an across-the-board increase in all of those taxes of almost 10 percent. Financing a takeover through the state income tax would shift the tax burden rather than reducing it. Poorer parts of the state would generally pay less, while richer areas would pay more. (See Table 4 and Appendix 5.) One group that clearly stands to lose is out-of-state commuters, who would go from contributing nothing toward Medicaid’s local share as of now, to carrying 17 percent of the cost post-takeover. Assuming the increase is weighted toward higher income groups—as such proposals usually are—this approach would further increase the state’s heavy reliance on revenue from high earners, and from the financial sector in particular. This would heighten the state’s fiscal vulnerability to volatility on Wall Street and the broader economy. Any move in this direction would also aggravate New York’s status as a high-tax state. The enactment of federal tax changes last year—which capped the deductibility of state and local tax payments—effectively increased the marginal cost of residing in New York compared to states with lower taxes. The net combined state-and-city income tax rate on New York City’s highest earners has jumped to almost 13 percent, its highest level ever, and second only to California among the 50 states. In this context, any significant income tax hike would further damage New York’s economic competitiveness and undermine the benefit of tax relief at the local level. Especially counterproductive would be any increase in taxes on health care itself. The state already raises $4.5 billion per year from taxes on health insurance.18 A takeover that excludes New York City would entail a 51 percent increase in these surcharges, which are already among the largest levied by any state. A statewide takeover would require an increase of 169 percent. This approach would further drive up the cost of health insurance for New Yorkers, who already pay some of the highest premiums in the U.S. This would cause more people lose or drop coverage and ultimately drive up Medicaid enrollment and costs. While there is certainly waste in the state budget, financing a Medicaid takeover through spending reductions would require much more than belt-tightening. Realistically, a cost-cutting effort on this scale would have to consider the two largest items in the state budget: school aid and Medicaid itself. A takeover could hypothetically be funded by a 29 percent cut in school aid. But that would likely backfire if local districts responded by raising their property taxes, which are much costlier for most homeowners than county taxes. Finding sufficient savings from the program would be complicated by the federal aid formula, which matches state and local spending on a roughly dollar-for-dollar basis. As a result, the state would have to cut overall Medicaid spending by $15 billion—or 22 percent—to achieve net savings of $7.6 billion for itself. Even after a 22 percent cut, however, New York would still rank among the top 10 states in terms of per capita Medicaid spending. Another desirable approach would be improving the efficiency of care delivery—for example, by encouraging patients to use clinics and urgent-care centers instead of emergency rooms for non-emergency issues, or better managing chronic illnesses such as diabetes and asthma to avoid hospitalizations. If successful, these steps would have the added benefit of improving outcomes for recipients. However, the state already devotes considerable resources to eliminating waste through the comptroller’s office, the Health Department, the Office of the Medicaid Inspector General and various law enforcement agencies. The state is also currently improving efficiency by enrolling most recipients in managed care plans and increasing coordination among providers through the Delivery System Reform Incentive Payment program. Given those existing efforts, it’s unlikely that additional anti-fraud and efficiency efforts, by themselves, would generate $15 billion in savings in the short term. To quickly lower spending by 22 percent, the state would have to consider more politically difficult steps, such as cutting fees to providers, trimming benefits for recipients or reducing enrollment. Each of those steps comes with drawbacks. Medicaid fees are generally lower than those paid by Medicare and commercial insurance, and many providers report losing money when they treat Medicaid recipients. Among other consequences, this discourages doctors from participating in the program and strains the finances of hospitals who serve the needy, potentially compromising the quality of care for all patients. A further significant reduction in fees would aggravate all of these problems. Such steps would affect the range of Medicaid recipients, from low-income able-bodied adults to severely disabled children and frail residents of nursing homes. Many would have no other way of paying for the services, and their health and quality of life might be compromised as a result. The state could potentially trim the rolls by, for example, restricting eligibility for the “medically needy,” who live above the poverty line but have medical or nursing-home bills that exceed their income. The challenge of eliminating counties’ Medicaid costs becomes more manageable if the change can be phased in over a period of 10 to 20 years. 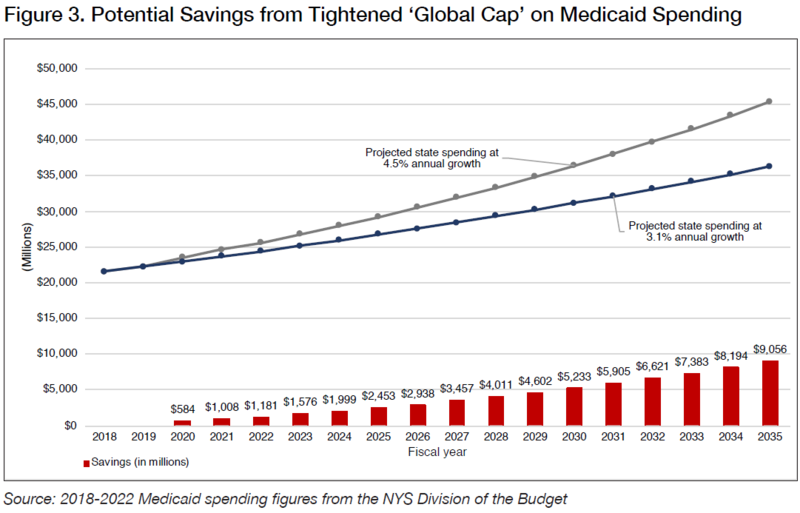 This opens the door to an existing cost-cutting strategy with a record of success: the “global cap” on Medicaid spending growth. If the existing cap were broadened and strengthened, it could potentially generate enough savings to finance a gradual takeover. To find the necessary savings, the governor empaneled a Medicaid Redesign Team representing various stakeholders in the health-care system. If the team’s efforts fell short, the health commissioner was empowered to cut Medicaid fees as necessary to meet the cap. This system largely worked as intended, especially in its early years. 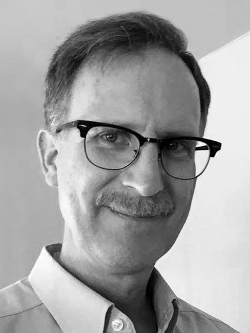 Under Medicaid director Jason Helgerson, the Redesign Team advanced dozens of reform ideas intended not just to save money, but also to improve care and broaden access. Perhaps most importantly, the state enrolled a far greater share of Medicaid recipients into managed care plans, including groups that had previously been exempt, such as the mentally ill and nursing home residents. Over time, however, weaknesses in the global cap became apparent. It restrained spending on the bulk of the program, known as Department of Health (DOH) Medicaid, but did not cover services provided through the Office of Mental Health, the Office for People with Developmental Disabilities or the Office of Alcoholism and Substance Abuse Services. Certain expenses were also exempted, such as labor costs associated with a Cuomo-sponsored hike in the minimum wage. Meanwhile, enrollment leveled off, rendering the cap significantly less restrictive. Per-recipient spending climbed back to more than $11,000. If the growth rate could be lowered by 1.4 points—the difference between medical inflation and the current trend—the annual savings would be substantial. As shown in Figure 3, they would reach $1.2 billion by fiscal year 2022, and $8.2 billion—enough to eliminate the local share—by 2034. First, it could be expanded to cover all Medicaid spending, including the portions managed by OMH, OPWDD and OASAS and minimum wage-related costs for all providers. Second, the global cap should be supplemented with a per-recipient cap, to protect against excessive spending growth when enrollment is flat or declining. State officials would still face the hard work of removing waste and improving efficiency and, possibly, the hard choices to cut fees, benefits or enrollment. But they could do so gradually and carefully, without sudden or severe changes. If the goal of a state takeover is property tax relief—as opposed to giving local officials more money to spend—the state will need to set guidelines for how the savings are used. A readily available mechanism is the state’s property tax cap. * Enacted in 2011, this law limits the year-to-year growth of each jurisdiction’s property tax collections to 2 percent or the inflation rate, whichever is less. The cap applies to the total amount to be raised by property taxes, known as the “levy,” with certain limited exceptions. The cap can be overridden only with approval by a 60 percent majority of the decision-making body—which, for counties, would be a legislature or board of supervisors. The law does not currently apply to New York City. In enacting a takeover plan, the state could require that the annual savings accruing to each county be subtracted from its current levy before calculating the capped amount for the next year. Take, for example, a hypothetical county with a property tax levy of $100 million and Medicaid takeover savings of $5 million. As things stand now, it would be allowed to increase the levy by as much $2 million, to raise a total of $102 million in the following year—plus spend the $5 million as it wished. Under a modified cap, the county’s current levy would be reduced by the $5 million in savings, to $95 million. The county would then be allowed to increase taxes by no more than 2 percent of that reduced base, or $1.9 million, for total collections of $96.9 million in the ensuing year. Instead of increasing by $2 million, tax collections would decrease by $3.1 million. Under this plan, a county would have the flexibility to override the cap, but only with 60 percent approval by its legislature in a separate vote preceded by a public hearing. This would put the public on notice of the decision and encourage local officials to prioritize tax relief. The tax cap, as modified, could be expanded to include New York City—requiring the City Council to clear at least one additional hurdle before adding to the city’s already enormous tax burden. Using the savings to reduce the city’s income tax—as contemplated in one of the Senate GOP proposals—would be more complicated. While property tax rates are controlled by the City Council, changing city income tax rates would require further action by the state Legislature. The local share of Medicaid has evolved into something that’s hard to defend, but also hard to unwind. Eliminating it entails either the reallocation of almost $8 billion in state resources, or $15 billion in cuts to a program that pays medical bills for one in three New Yorkers and serves as a financial mainstay of the state’s entire health care system. Because the current system distributes costs so unevenly, any solution must therefore distribute relief unevenly. Including New York City more than triples the cost, from $2.3 billion to $7.6 billion, but excluding it would be manifestly unfair and politically impractical. The most plausible approach is to slowly phase out the local share over a period of 10 years or more, and make up for the lost revenue with savings squeezed from the Medicaid program itself—which, despite efficiency improvements, remains much costlier than national norms. The state effectively began that process more than a decade ago, when it capped and then froze local payments, causing them to gradually shrink in real terms due to the effects of inflation. Committing to full elimination, however, would be a major escalation, both in dollars and in difficulty. Leaders committing to this path must be prepared to grapple with tough choices for years to come. Click here for the full report, with appendices. low Medicaid property tax impact. See Appendix Table 3 for detailed county percentages. National Association of Counties, “Medicaid and Counties: Understanding the program and why it matters to counties,” January 2017, http://www.naco.org/sites/default/files/documents/NACo-Medicaid-Presentation-updated%201.26.17.pdf. Data provided to the author by the New York State Association of Counties. Data provided to the author by the New York State Division of the Budget. Op. cit., NYS Association of Counties. 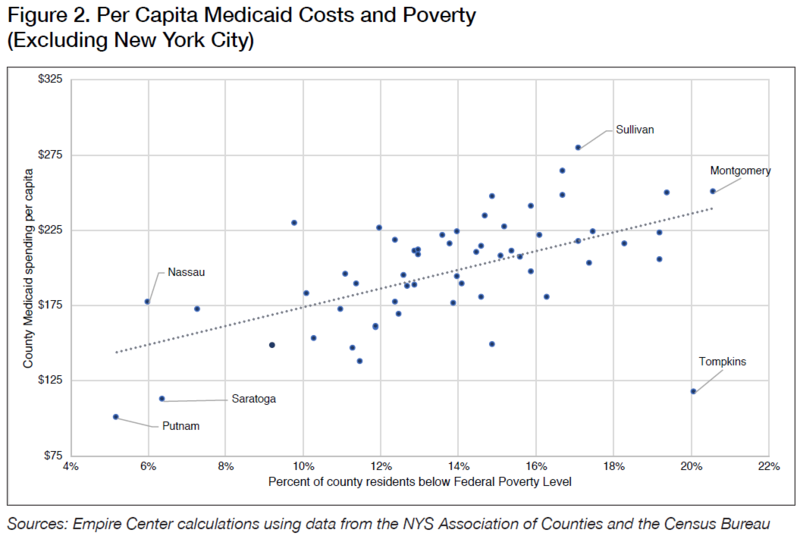 Citizens Budget Commission, “A Poor Way to Pay for Medicaid: Why New York Should Eliminate Local Funding for Medicaid,” December 2011, https://cbcny.org/sites/default/files/media/files/A%20Poor%20Way%20to%20Pay%20for%20Medicaid.pdf. Op. cit., Division of the Budget. Based on county revenue and spending figures for 2016 obtained from OpenBookNewYork.com, operated by the New York State Office of the State Comptroller. “Mr. Cuomo’s Medicaid Cure,” The New York Times, February 18, 1994. https://www.nytimes.com/1994/02/18/opinion/mr-cuomo-s-medicaid-cure.html. “Our Vision for New York: Structural Changes for a Stronger State,” Assembly Republican Conference (PowerPoint presentation), April 17, 2018. Senate Bills 8411 and 8412 of 2018. Assembly Bill 2236 of 2018. FY 2019 Updated Financial Plan, New York State Division of the Budget, May 2108, p. 73, https://www.budget.ny.gov/pubs/archive/fy19/enac/fy19enacFP.pdf. E.J. McMahon, “Heastie’s gazillionaire tax,” New York Torch, January 26, 2017, https://www.empirecenter.org/publications/heasties-gazillionaire-tax/. Op. cit., FY 2019 Updated Financial Plan, p. 106. Budget numbers for FY 2019 obtained from SeeThroughNY.net, operated by the Empire Center, https://www.seethroughny.net/nysbudget/disbursements/. Calculations by the author based on data from the Centers for Medicare & Medicaid Services and the Census Bureau, https://www.empirecenter.org/publications/medicaid-chip-spending-bystate/. Audit Report 2016-S-60, Office of the State Comptroller, June 2018, http://www.osc.state.ny.us/audits/allaudits/093018/sga-2018-16s60.pdf. Listing of mandatory and optional Medicaid benefits at Medicaid.gov, https://www.medicaid.gov/medicaid/benefits/list-of-benefits/index.html. Bill Hammond, “The Cost of Cures,” Empire Center, April 10, 2018, https://www.empirecenter.org/publications/the-cost-of-cures/. Calculations by the author based on data from CMS and the Census Bureau, https://www.empirecenter.org/publications/medicaid-chip-enrollment-vs-poverty-rate-by-state/. Dan Goldberg, “28th time’s the charm,” Politico New York, January 18, 2018, https://www.politico.com/states/new-york/newsletters/politico-new-york-health-care/2018/01/18/28th-times-the-charm-025437. “Governor Cuomo Announces On-Time Passage of Historic, Transformational 2011-12 New York State Budget,” press release from the governor’s office, March 31, 2011, https://www.governor.ny.gov/news/governor-cuomo-announces-time-passage-historic-transformational-2011-12-new-york-state-budget. Per-recipient spending figures based on calculations by the author. For more on the track record of the Medicaid Redesign Team, see also, “What Ails Medicaid in New York: And Does the Medicaid Redesign Team Have a Cure?” Citizens Budget Commission, May 2016 (https://cbcny.org/sites/default/files/media/files/REPORT_MEDICAID_05232016_1_0.pdf), and “Medicaid in New York: The Continuing Challenge to Improve Care and Control Costs,” Office of the State Comptroller, March 2015 (http://osc.state.ny.us/reports/health/medicaid_2015.pdf#search=%20medicaid). Op. cit., FY 2019 Update Financial Plan, pp. 99-101. A state takeover of local Medicaid costs is more complicated than it sounds. Taking over local Medicaid costs, a difficult task, wouldn't deliver much by way of property tax relief.